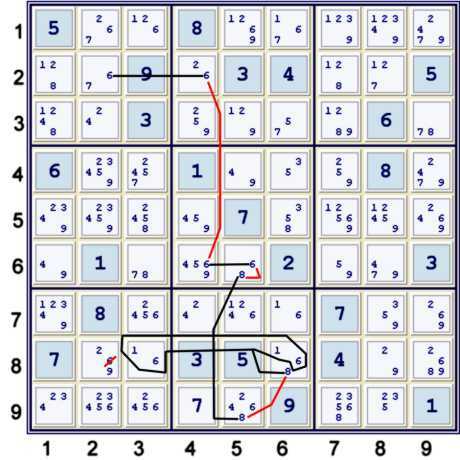 The following is the second page of an illustrated solution for the sudoku.com.au tough puzzle of 12/21/07. The previous page primarily attacked candidates 78 and their grid interactions. This page will continue that theme, but add a few wrinkles. There are many possible deductions and eliminations not taken on this page. The one's that are shown below have been picked either for their utility for this particular puzzle, or for their instructive power, or simply because they seemed elegant to me. This deduction has been available for quite some time. It has been asserted (elsewhere) that if one is to utilyze AUR, then one should make all such AUR deductions at once, since one loses the AUR power after destroying the AUR possibility. This assertion is false. If any Uniqueness sis be true, they are ALWAYS TRUE for that puzzle. Any assertion otherwise is not logical. 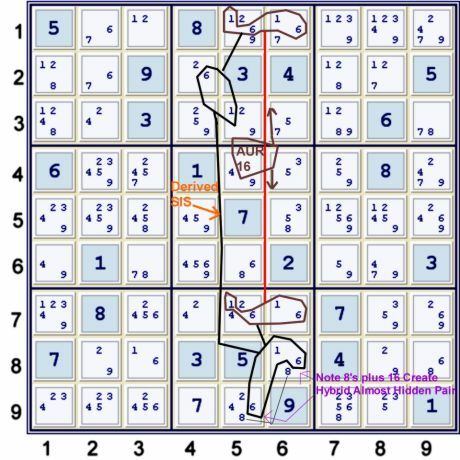 In my opinion, the true power of uniqueness considerations in Sudoku have not yet been fully utilyzed. Again, this deduction has been available for quite some time. This deduction is newly available in this shortened form because of the previous step. Above, the almost naked pair 16 r8c36 is an important key. The newly stronger 2s in row 8 make the next step much easier to find. Above, the choice to eliminate 2 from r1c2 is arbitrary, as one could just as easily eliminate 6 from r9c2. 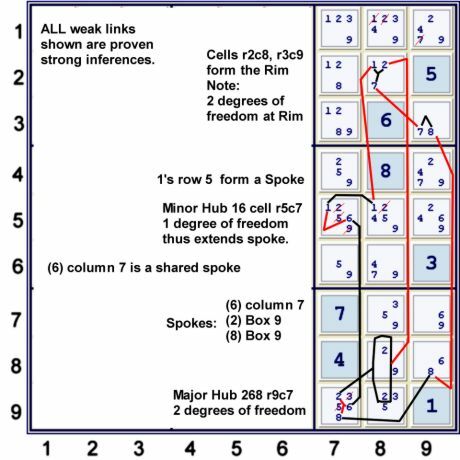 The Kraken cell consideration of all possible values for cell r2c8 is key. Note that the stronger 6s in column 7 from step 2l are also important. Probably, I prefer the latter presentation. 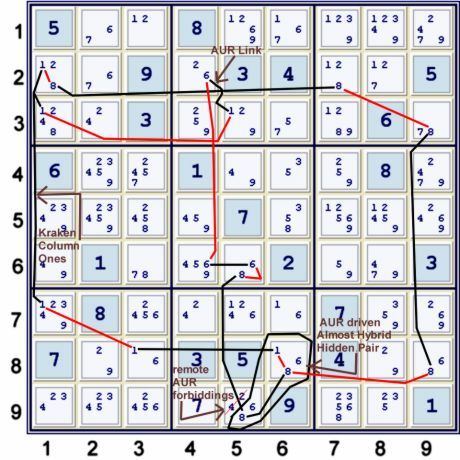 Below, I build a strong inference set (sis) based upon the AUR16 r17c56 (Almost Unique Rectangle). There are many ways to do this, and there are many short deductions possible from the resultant possible sis's. However, I choose to build the following one as it eventually catches quite a few of the possible eliminations. Maybe it catches them all. This hybrid hidden pair is a newly coined term, I think. Really it is just a natural extension of the Super Cell concept. It serves as a way to efficiently and logically reduce the size and complexity of this particular AUR sis. The potentially five-headed sis is thus reduced to a three-headed sis. One still likely needs a net to handle any deductions from this sis, however the potential net complexity is significantly reduced. (8)box 8 (+2) - note I have not yet decided 8's are an endpoint! 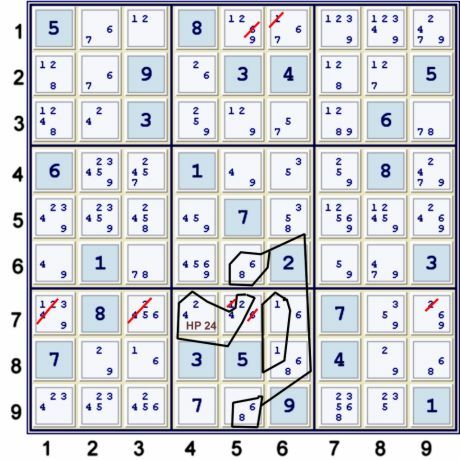 Place (68)r9c5 both in result column (-2) total zero. Done. One can now easily build the implied Triangular Matrix. One can also rewrite the deduction into a bit of scrambled AIC form. Note that the hybrid almost hidden pair concept is key, but not actually required in the counting method. Nevertheless, I find it useful as it tells me that counting will be reduced. This is by far the most difficult elimination used in this solution. 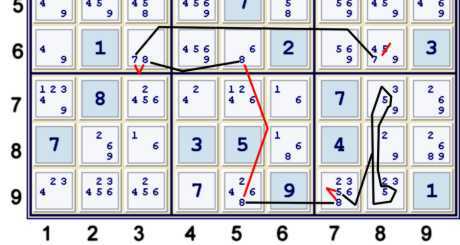 However, it serves to significantly unlock the puzzle. Since it is very powerful, I judged it to be worth the effort. This sets the stage for a very pretty step - at least I find it pretty! Step 2v A wrap around net - Also known as a Hub, Rim & Spokes. (8)r8c9,r9c7 (-1), total (0) - done. I have attempted to label the parts of this animal above. The usefulness of this categorization is questionable. If the labels serve to add confusion, kindly ignore them. The deduction stands on its own without needing a name for its parts. However, since it has been named, I thought it wise to recognize that fact. Because this deduction is analygous to naked sextuplet, it does not easily transfer into AIC. 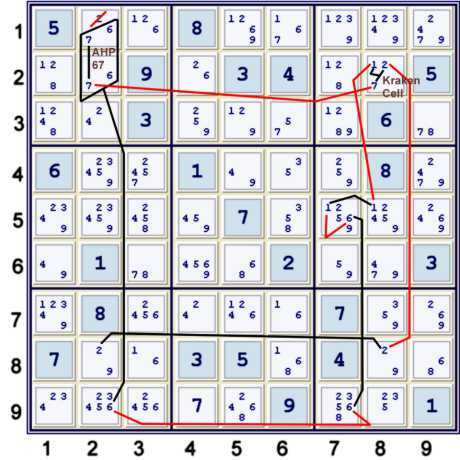 Rather than attempt that exercise, below find the symmetric pigeonhole matrix. After making these eliminations, (3)r1c7 %column => UP 25, finally! At this point, the puzzle is significantly undone. A few relatively easy steps remain. The puzzle will be finished off on the next page. 11-10-06, 2-20-07, 4-21-07, 8-26-07, 9-4-07, 10-3-07, 11-8-07, 11-26-07, 11-28-07, 12-21-07, 1-14-08, 1-15-08, 1-17-08, 1-21-08.